A New York Times article from 2016 about declining sales of cold breakfast cereal cited a statistic that 40% of Millennials did not eat cereal for breakfast because it was too inconvenient to clean up after eating. “Millennials Killing Cereal” pieces were published for weeks thereafter. If you simply type “Millennials killing” into a Google search bar, the search engine will helpfully suggest that Millennials are killing everything from fabric softener to Home Depot to America. It makes it sound like an entire generation joined together in a nefarious plot to bring down long-established industries. To be clear, that’s not what is happening. Millennial spending habits are making an impact on industries, not because they look different from older generations. That’s to be expected. 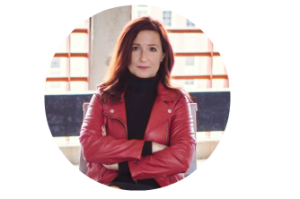 The impact happens because Millennial spending habits look different from older generations when older generations were at the same life stage as Millennials. Millennial college grads got caught in a perfect storm of crushing student loan debt and a terrible job market. Being in debt and underemployed put them behind financially. A 2016 research report by the Resolution Foundation shows that Millennials are earning approximately $10,000 less than GenX-ers were at the same stage. It also shows that Millennials will likely make $100,000 less in their entire careers compared to older generations. Millennials are value-conscious, but not so much that they’re willing to sacrifice quality. Where other generations might have purchased downmarket goods and services in order to save money, Millennials will purchase as high in the category as money will allow. Additionally, ethical and sustainable business practices often factor into the quality score in the Millennial mindset. Conspicuous consumption is alive and well, it just looks a little different in this generation. Millennials aren’t spending money on pricey cars or watches. Instead, they are looking for experiences that will leave a lasting impression. Millennials prioritize activities over physical purchases, with 71% citing experiences as the most important thing in their lives. That’s not something that’s going to go away: 97% of Generation Z says experiences are more important than “things”. Closely aligned with “experiences over stuff” is the ability to create and enjoy those experiences. Things that keep Millennials from the freedom and mobility they desire, such as starter homes and the 9-5 work week are no longer the imperatives they once were for past generations. Much has been made about the number of Millennials eschewing home ownership in favor of renting. While it’s true that for some a home might be financially out of reach, many cite the no strings, low-maintenance lifestyle that renting offers as the biggest benefit to renting. The reports of the untimely demises of whole industries may make for clicky headlines, but they only tell part of the story. Millennials are extremely supportive of local small businesses and entrepreneurship and this factors into their buying decisions. For example, Millennials aren’t really killing beer. Sales of big brand beers might be down, but consumption of microbrews has increased every year since 2009. Small and independent craft brewers saw a six percent rise in volume and accounted for more than 12 percent market share in the beer industry in 2016. Fifty-eight percent of craft beer drinkers are under the age of 35. 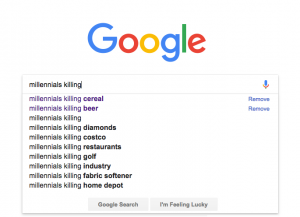 Millennials aren’t killing anything, but their market demands are surely causing businesses to examine their approach as they proceed into the future. And why wouldn’t they—in the U.S. alone Millennials wield about $1.3 trillion in annual buying power, and this year they will have the most spending power of any generation. That’s a lot of Lucky Charms. An eye opening piece. But here in FL, mills are purchasing homes more frequently than renting because their monthly mortgage expenses are cheaper than apartment rentals! The average monthly rent is $1500+ vs less money spent on house payments, insurance, and utilities combined total. Sad for everyone except the contractors.